The food pirates are uncovered; a clue to the path to Earth is found. This was the final issue of the Marvel comic book series of Battlestar Galactica, ending over a year after the TV series was canceled. 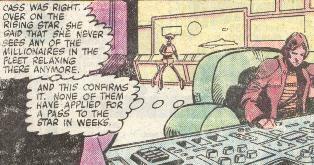 In this issue, Muffit, who was destroyed in issue #14, "Trial and Error", is repaired and returned to Boxey; Master-Tech Shadrack's findings indicate that Earth lies within another galaxy from their own; and the Cylons receive a signal regarding the human fleet's path of retreat, setting things up for the segue back into the TV episodes (starting with "The Gun on Ice Planet Zero", where the Cylons are chasing the fleet again, and into "The Lost Warrior", where the fleet enters another galaxy. As Apollo sifts through the Galactica's data banks on page 3, panel 1, there appears to be a robot manning a console behind him. Page 7 reveals that Sire Uri's homeworld is Leo. Page 11, reveals that the top deck of the Rising Star used to be a private club for Sire Uri and his cronies. On page 14 panel 3, Boomer uses the Earth phrase, "Holy cow!" Page 23 reveals that the symbol of the 9th Lord of Kobol itself indicates the bearings and distances to the pulsars that Adama learned about from his recollections (gleaned by the memory machine) of the inscriptions in the tomb of the 9th Lord on Kobol. On page 27, Jolly reflects on the fact that his roommate "Pops" (Sire Kocinik) on the Burnham, was the food pirate's inside man and that he will never trust anyone over 200 again. This could be a joke of exaggeration, but could be taken literally, as the BSG novels suggest that even Adama is over 100 yahrens old. As punishment, Commander Adama decides to leave the pirates behind in their headquarters ship, the Justice, with its star drive rendered useless, stranded as the rest of the fleet makes the first hyperspace jump on their new course for Earth. Unfortunately, this course of action allows a pilotless Cylon drone to pinpoint the last known location of the human fleet and signal the Cylon Alliance, setting the robotic menace back on the fleet's path. With the Justice left behind, this brings the fleet down to 217 ships (last seen at 218 in "Collision Course").